TurboTax hides a lot of details “under the hood” about tax forms that many of us don’t care to know about. If you’ve used TurboTax to file your taxes for a number of years you might remember that the desktop version of the software had two different modes you could choose between Step-by-Step or Forms mode (you can’t do this in TurboTax online). Step-by-Step mode was the interview approach that asked you a series of questions about your finances and then filled out the actual form for you based on your answers. If you wanted to you could switch over to Forms mode that showed you the tax forms that TurboTax was filling out on your behalf and you could manually edit those forms. For many people, peeking under the hood at your tax forms probably did you as much good as peeking under the hood of my car does for me. Sadly, I don’t know much about cars. I don’t know everthing that goes into designing and building a car, I don’t even know how to work on a car. All I know is that when I turn the key, I want it to start so I can drive where I need to go. If you don’t know much about filing your tax return then TurboTax can do something similar for your state and federal tax returns. Just because you use tax software like TurboTax doesn’t mean you can’t do tax planning and necessary maintenance throughout the year. Keeping with my car example, even though I don’t know how to work on the car myself, I do know that I need to take it in for an oil change every 3,000 miles. I’ve also learned to plan my trips so I put less milage on the car and how to drive our Honda so it lasts longer. Same with your taxes, even though you use software to prepare them, you should still learn about the available tax credits and tax deductions. That way next year when you’re answering questions in the tax prep software, you can answer yes to the questions that will bring you more tax breaks and save you money. You may also have to do regular maintenance like making quarterly payments based on your withholdings and how much you owed in taxes the previous year. Now onto the giveaway. Intuit has given me two TurboTax coupon codes, one for the TurboTax Deluxe version and one for the Premier version. I really liked the idea of a “tax kit” from my H&R Block at Home giveaway a few weeks ago so I’m going to throw in an Amazon gift card to make this a tax kit as well. 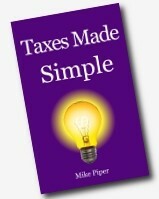 The gift card will cover the cost of the book “Taxes Made Simple” by Mike Piper and a Smead Tax Organizer – so you can get an overview of income tax and a tool to organize your tax reciepts (order them together and shipping is free). One kit will have a TurboTax promo code for Turbo Tax Deluxe, the other kit will have a promo code for the Premier version. 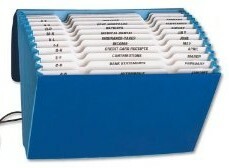 In my last tax return giveaway the most popular tax tip was to pick a single place to keep your tax reciepts and file them away as they come in throughout the year so I think this organizer could come in handy. To enter this giveaway share what part of doing your taxes is the most confusing or frustrating to you. Maybe it’s already handled “under the hood” by tax prep software or maybe it’s something you’d like to see handled in the future. This tax kit giveaway will end on March 12, 2012, when two winners will be randomly selected. The winners will be notified via email and I’ll send you the information about using your TurboTax promo code and the Amazon gift card. Good luck! What frustrates me most is when I learn of a tax deduction after I’ve filed my taxes. So, I’m procrastinating this year and hoping to find all the deductions I qualify for before I file. This giveaway sure would help. Thanks! I have four kids with interest and dividend income. I always find determining if the “kiddie” tax is going to kick in is both frustrating and time consuming. I get the most confused with itemizing. My husband has his own side business selling books so trying to keep it all organized is the most confusing part. Luckily it’s a small (very small) business so it’s not way too overwhelming. We do use Turbo Tax every year so that makes it so much easier. Thanks for the chance to win this…we are procrastinators and haven’t done ours yet. My husband and I have to do taxes in both Canada and the US – I find it very overwhelming to keep the two straight. When we first moved to the US we had someone do our taxes and for $750 he did what we could have done ourselves. Using Turbo Tax for the past few years has definitely helped us. Trying to keep up with staying organized through the year so everything is in one place come tax time. Would love to use turbo tax online for free! Income sources without W2s make things more difficult for us. is this ok for Canadian taxes too? The button in the post doesn’t seem to work – it gives an error when submitting the response. here’s my entry: The need to keep all papers in order and readily available for when I actually sit down to do my taxes. A great program for those wanting to do their own taxes – and an awesome giveaway! Sadly… I still have little confidence in doing my own taxes, so I always turn to a professional.